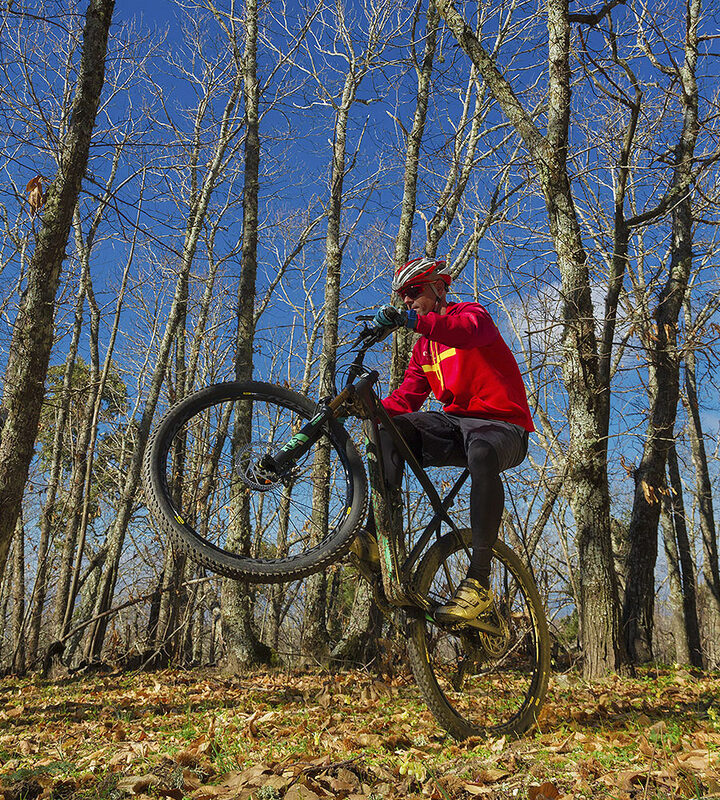 Montánchez: An All-Terrain Bike Destination. 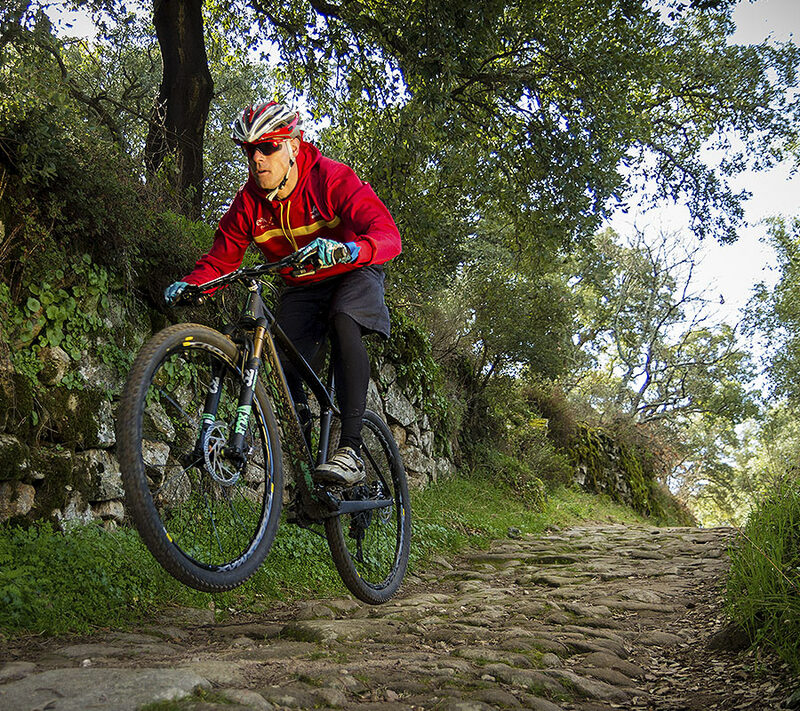 We are convinced that the creation of trails and an all-terrain biking center in Montánchez highlights our natural surroundings and our pathways full of history, while likewise strengthening our ability to do sport in perfect harmony with nature. 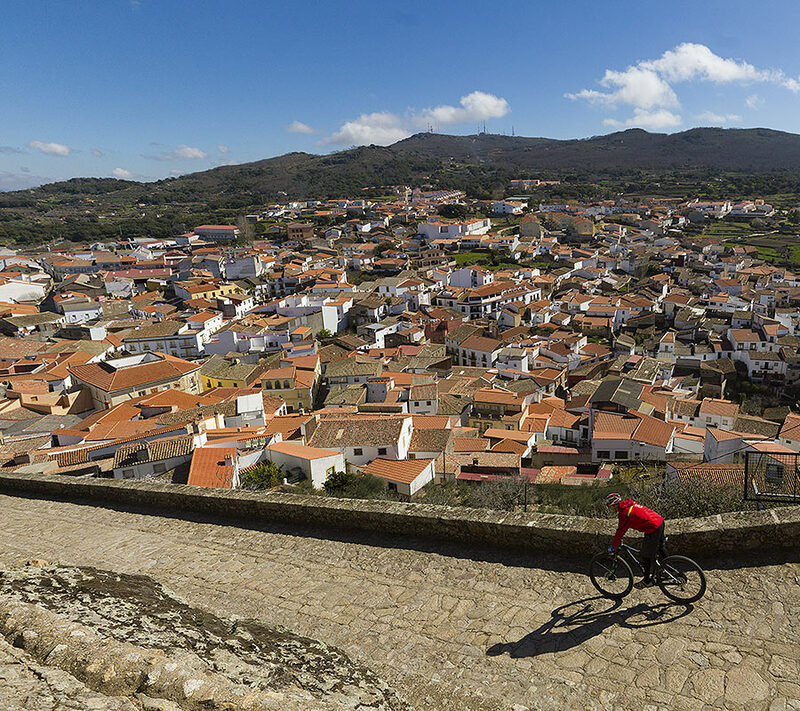 More specifically, Montánchez and its rich natural surroundings meet and surpass all the necessary requirements to act as home to a network of all-terrain bike trails, as the region brings together great ecological and scenic potential. The Sierra de Montánchez Mountain Range is the most western part of the Montes de Toledo Range and it helps to divide the basins of the Tagus and Guadiana Rivers. From its hills, one can take in impressive views of the meadows that make up this rich community, while likewise admiring views of a good part of Extremadura’s geographical features. Traditional mountain agriculture, put into practice by the inhabitants of these central highlands, has promoted –over time– the creation of a formidable mosaic of cultures which combine with all types of habitats; habitats which are characterized by the type of vegetation that predominated therein: chestnut trees, oak groves, cork oaks, and holm oaks with their related scrub – cleared in varying degrees to make way for gardens, olive groves, vineyards, wet grasslands, and gorges, including the typical vegetation that is likely to be found in these areas. To tie all of these places together, an extensive and rich network of paths and alleyways was created long ago, flanked by stone walls, a proud example of the efforts of those who lived in Montánchez. 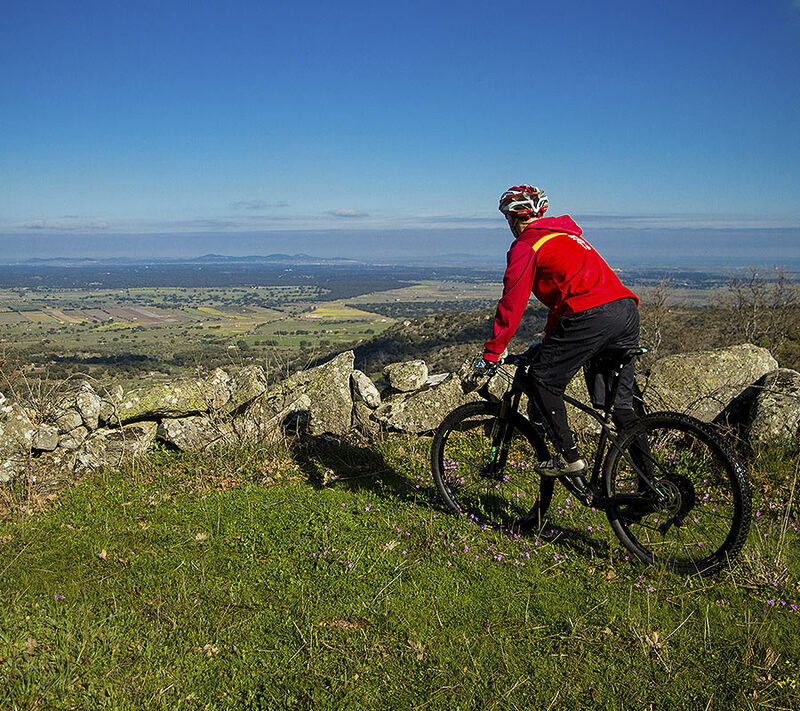 This network of paths is undoubtedly the richest of all Extremadura and it has no rival when compared to any other geographical feature of the Province. Therefore, an interesting and attractive network of all-terrain bike trails has been created: 67 kilometers divided over five official, circular routes whose starting point is at the esplanade which serves as an entrance to the “Fuentes del Salor” Complex. Later, this trail winds down through the “Canaleja de la Torre” area towards Torre de Santa María. At “La Vidarta,” the trail links with Colada de la Moraleda. Bordering the entire mountain range, it goes towards the “Las Aguas” area, where it crosses the Salor River. 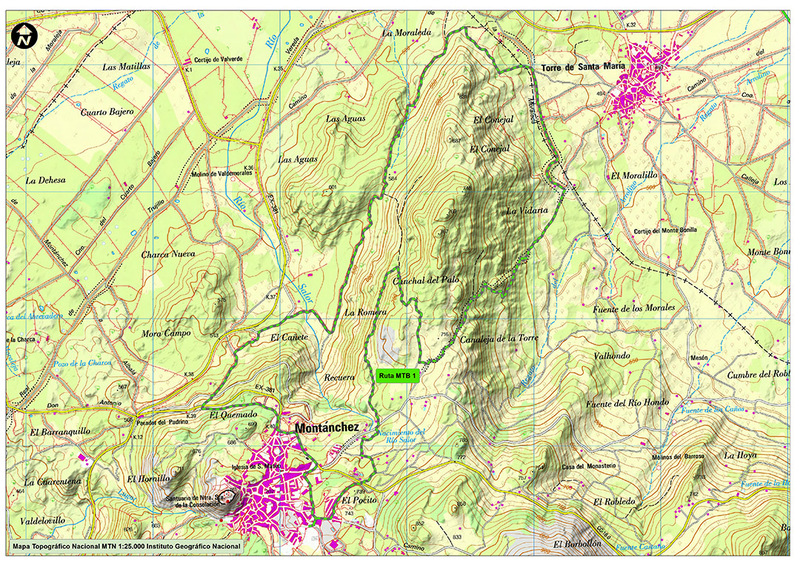 Finally, the trail goes upwards towards the “El Cañete” and “El Quemado” areas and then arrives at Montánchez. This trail leaves the municipality through the “El Pocito” area and goes towards the “Recuera” Canyon, where the Salor River’s first few meters are located. 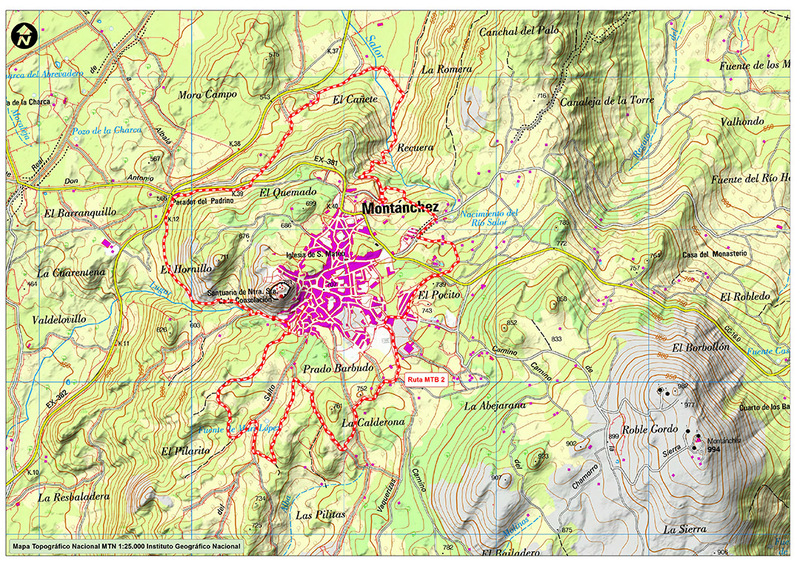 Later, it once again travels upwards through the “El Cañete” and “El Quemado” areas, only to subsequently descend towards the “Parador del Padrino” Hotel. The route travels over the western skirt of the hill, where the castle and sanctuary of Nuestra Señora de la Consolación (Our Lady of Consolation) is located. It crosses the stream in that area and heads towards the south in order to later undertake a short but strong ascent through the “El Pilarito” area. Finally, this impressive circular trail travels through the “Prado Barbudo” and “La Calderona” areas only to end up at the municipality of Montánchez. This trail leaves the municipality through the “El Pocito” area and goes towards the “Canaleja de la Torre” area, descending towards the east and later turning to the south towards the mills along the Barroso River. 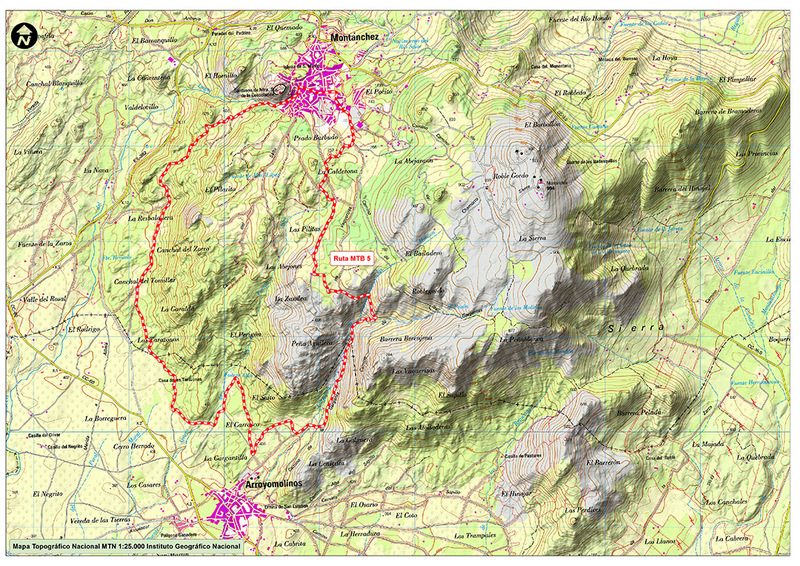 Going through the “El Robledo” area, the trail takes the direction of Fuente Castaño, traversing the Bardasquillo Path, where it also crosses the highway and –after a slight ascent– passes over the “Collado de los Bardasquillos” hillock only to descend once again over the “Barrera del Hinojal” pathway. Later there is a strong ascent up the “Camino de la Casa de los Hermanos” (“Siblings’ House Path”) towards the highest altitudes of the mountain range. Lastly, the trail goes back down over the “Camino del Chamorro” Path, traversing the chestnut tree grove and once again returning to the starting point at Montánchez. The tail goes towards the south over the well-known path that travels towards the chestnut tree grove, a path which is also known as the “Camino de las Gargantas” (“Path of the Gorges”). 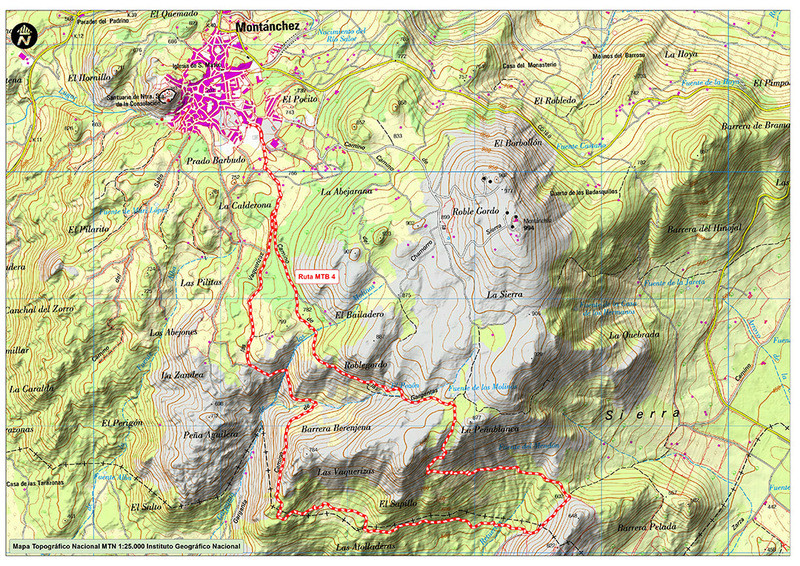 Over these first few kilometers, the path is shared with the “Donde Nace” (“Where it Begins”) Trail. At Fuente de los Molinos, the paths separate and our trail goes towards the south to undertake a strong, technical descent over the “Morro de Peñablanca” mountain trail. Once we’ve gone down the mountain range, we link up with the “Las Vaquerizas” Path that travels over the southern side’s skirt towards the west. When we get to the “Garganta de los Molinos” (“Mill Gorge”), the trail turns towards the north to connect with the “Ruta de los Molinos” (“Mill Path”) and once again return to Montánchez. The tail goes towards the south to travel down the “Garganta de los Molinos” (“Mill Gorge”), but it does not use the well-known path that gives the route its name. On this trail, we will travel through the “La Calderona,” “Las Pilitas,” and “La Zaudea” areas before descending the canyon. 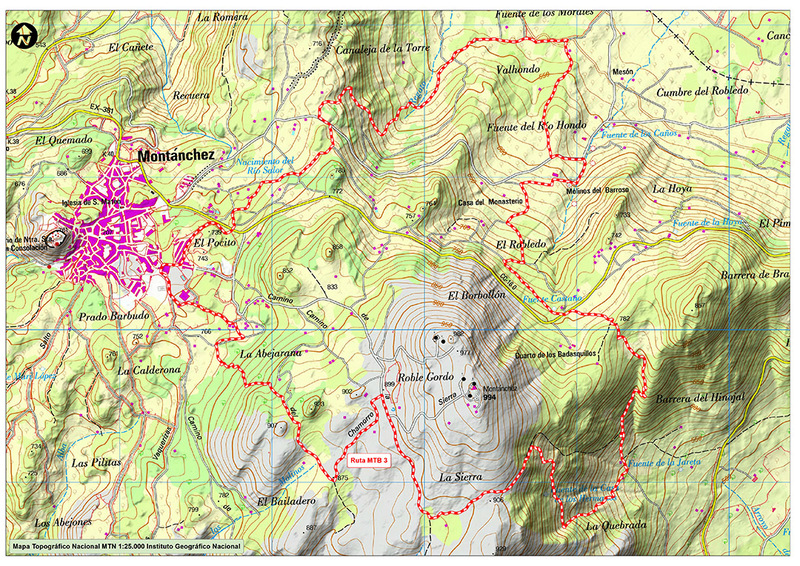 Once the “Garganta de los Molinos” (“Mill Gorge”) has been descended, the trail takes a clockwise, circular direction over all the paths that travel the mountain’s skirt – traversing the “Las Tarazonas,” “Canchal del Tomillar,” and “Canchal del Zorro” regions to end up in the western part of Montánchez’s city center.